A beautiful smile can be very distracting if your gums are too prominent. Our gums serve an important purpose, but certainly should not be the focal point of your smile. Large, thick gums tend to make teeth look short and stubby, which is not nearly as attractive as longer, more visible teeth. We all know someone, that one friend, who always covers their mouth when they smile. Laughing or smiling should be natural. When you are so uncomfortable with the appearance of your teeth or gums that you feel compelled to cover them, it's time for a change. Let's examine gum contouring and the positive affect it can have on your smile. If this procedure is something you are seriously considering, be sure to ask your dentist to show you some before and after cases. Case studies and photos will provide you with a better idea of what to expect during this treatment. It's best to ask questions if you are nervous. If you anticipate any upcoming dental treatments, it is in your best interest to inquire about all of the procedures to avoid additional unnecessary appointments. In past years, dental providers would actually cut the gums with a scalpel to remove unnecessary gum tissue. Thanks to improving technology, gum contouring today is minimally invasive, much quicker, and pain free. There are occasionally cases where a scalpel is required, but a laser is utilized for most gum contouring treatments. 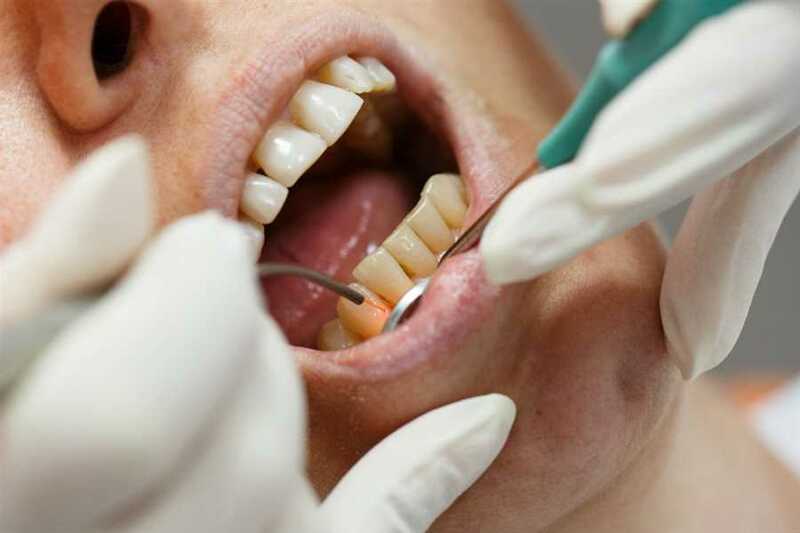 By using a laser, a dentist or dental surgeon can carefully and painlessly remove or contour your gums back to provide you with a smile where your teeth (not your gums) are more prominent. They simply trim your gumline back and reveal your gorgeous teeth. This minimally invasive laser treatment option is fast, safe, and relatively painless. You can experience a small amount of discomfort, but a mild local anesthetic keeps any pain minimal. The laser also cauterizes while it trims, sealing up any lacerations so there is very little bleeding and dramatically reducing the chance of infections. Best of all, this can all be completed with one easy visit to your dentist! After a gum contouring procedure, your gums will be sensitive for a few weeks. It is important to be cautious with brushing, flossing, and what you eat. The good news is that there is typically no open sores, no stitches, and no pain with this fairly routine treatment. The recovery time is relatively short, depending on each patient and how much tissue was actually removed. There may be some swelling and slight soreness for up to a week, but that should be minimal. If your gum contouring issue is more severe and requires the use of a scalpel, there will be stitches and a longer recovery period. After a gum contouring procedure, you can expect a boost of confidence and the desire to show off your new smile! People will likely notice a difference in your smile, but it is often difficult to diagnose exactly what has changed. The important part is the noticeable change in how frequently you smile! Studies show that every time we smile, it triggers a “happiness” button in our brains. Smiling is directly linked to our overall happiness and overall health. When we smile or laugh, it triggers a chain reaction in our brain that sends a signal indicating everything is okay. This process eases tensions and allows us to relax. Endorphins are often released and act as a natural pain reliever, as well. Have you ever had a stranger walk up to you and say, "Smile!". In most cases, people look better when they smile. We also feel better. It's typically more pleasing to people when they see a smile and this makes us more approachable and appealing to other individuals. Flashing a big broad smile can also have a positive effect on those around us – it’s infectious and often causes other people to smile. It's very similar to yawning; Smile and the whole world smiles with you! It's actually proven that people will frequently smile when you initially smile at them. It's amazing how much better we feel when we smile. The more often you smile, the more natural it will become. People who are required to smile as part of their job know this all too well! A false or forced smile will show and that can have the opposite effect that we want, not only on us but on our audience. If someone can sense you are forcing your smile or your laugh, it often makes them suspicious that perhaps you are hiding something or that you are trying to cover something up. It's a shame for us to see someone covering their smile for any reason. If you are not pleased with your smile and are unhappy with your teeth or gums, there are definitely some good solutions. It is important to consult your dentist about the issue you are experiencing, even if you have a fear of dentists. Braces, teeth cleanings, whitening, and cosmetic dental surgery can make a world of difference in your self-confidence. Modern medicine is ever-evolving, especially in the areas of dental health and oral surgery. With the increasing use of lasers in all types of cosmetic and oral surgery, gum contouring is now included in that arena. If you are considering gum contouring, make a list of questions to ask your dentist. Gum contouring has evolved dramatically from the old days of using surgical tools to make incisions and there is no reason to be nervous! We encourage you to contact us for additional information or schedule a consultation. Let us provide you with something to smile about!